Todd Haines grew up sailing E’s with his mother and father on Mendota and then sailed on Pewaukee in X Boats, C Boats, E Boats and A Boats. He got his A Scow start crewing on Dwight Booth’s “Bud” in the early 1970’s and then with his father on the famous V-115, “LuLu”. He started driving A Scows in 1983 and has not missed a season since. 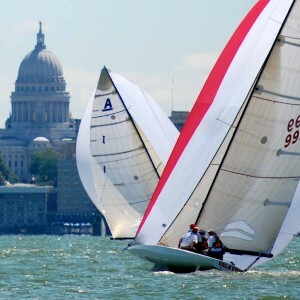 Todd has made sailing a passion from his early years as a sailing instructor at Pewaukee, to becoming the founding member of the NCASA in the early 2000’s. Todd has been the Executive Director of NCASA since 2004.